There is nothing more adorable than seeing two animals bonding and sharing a special friendship. Some of the best animal love stories to date have formed from the most unlikely pairs you could ever imagine. 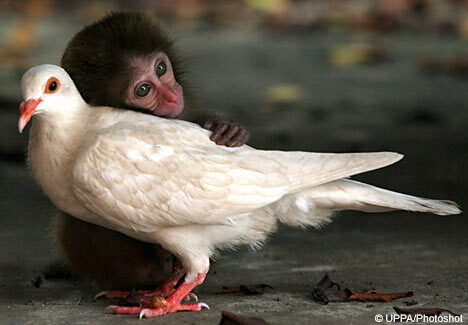 They're an odd couple in every sense but a monkey and a pigeon have become inseparable at an animal sanctuary in China. The 12-week-old macaque - who was abandoned by his mother - was close to death when it was rescued on Neilingding Island, in Goangdong Province. After being taken to an animal hospital his health began to improve but he seemed spiritless - until he developed a friendship with a white pigeon. Today the two are inseparable! 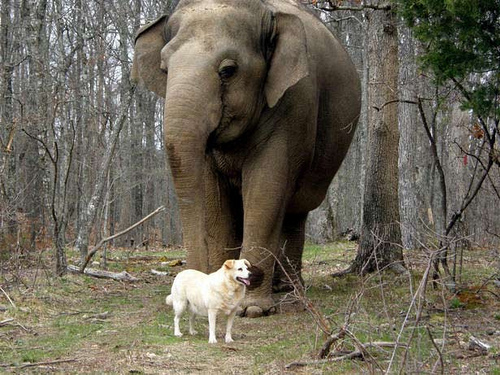 You may have heard the story about the bond between an elephant, Tarra and a stray dog, Bella who lived together as friends in a Tennessee animal sanctuary. The duo made headlines around the world for the love they shared for each other. They were so close, in fact, that once when Bella got injured a few years ago and had to spend three weeks recuperating in the sanctuary office, Tarra just stood in the field waiting. 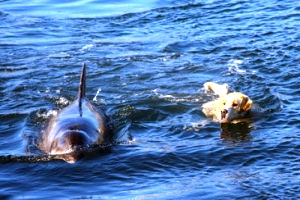 In recent months a normally land-loving Labrador called Ben has taken to pacing the island’s pier and then jumping into the water as soon as Duggie the dolphin appears. According to his owner, local hotelier, Pat Doohan, Ben and Duggie could spend up to three hours at a time and several times a day frolicking and playing in the sea. An unlikely couple, yet the two never go a day without bonding and playing in the ocean. Who has ever heard of a crow adopting a needy kitten? Well believe it or not that is exactly how the story goes in this next animal love story. 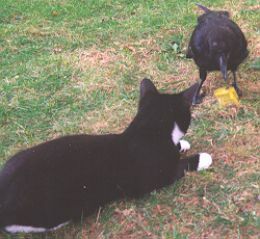 A homeless kitten was fed and played with everyday by a very loving and loyal crow! Eventually a nice man happened to spot the two playing and was so shocked at the unlikely friendship of the two animals that he adopted the kitten. It was no surprise of course that without a doubt, the crow came to visit every single day!